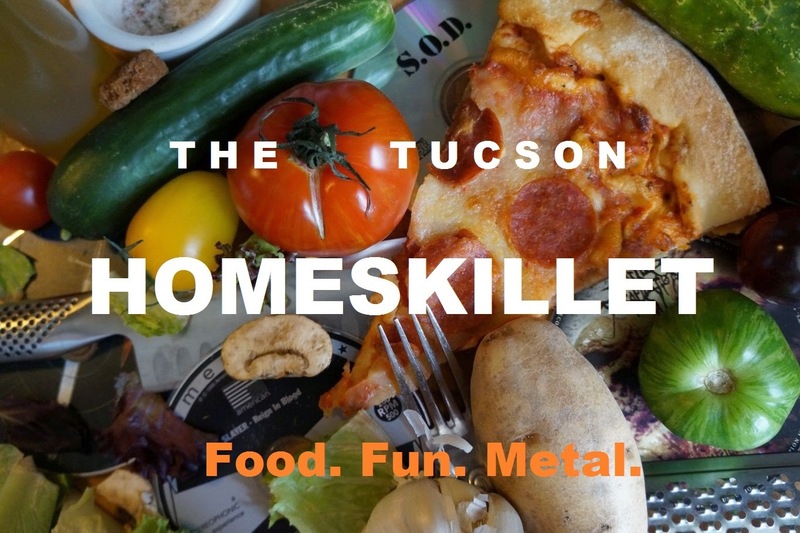 The Tucson Homeskillet: QQ Sushi: A Moveable Feast...Literally! QQ Sushi: A Moveable Feast...Literally! So I'm going to take this opportunity to tell you a story. I'll try to be brief even though it's quite a lengthy tale. She-Ra, my wife, and I met when I was still living in San Francisco. My day job was bartending near Fisherman's Wharf and I was her, and her friend's visiting from Arizona for a few days, bartender. According to her, I was the worst bartender ever and in two days we were engaged. Unfortunately, she had to go back to Tucson but she did come and visit for a week before I made the decision to drop everything and move to where she was, which was here in Tucson. During that week visit, on a walking tour of the city, we stopped into a sushi place, a style that she had never seen before and I had been to a handful of times. It was a "rotating" sushi restaurant, or a "sushi boat", which meant that rolls, appetizers and nigiri sat on different colored plates that floated on a steady stream of water, like a food armada, and the color of the plate indicated how much you would be paying. For example, if you grabbed a roll on a red plate, that meant you paid $3 for it, or a blue plate was $5, stuff like that. It was at this place that we realized that not only were we meant for each other but we both harbored a deep love for good sushi. Well, food in general. Now lets cut to ten years later and a sushi boat restaurant opens up near the university. Called QQ Sushi, it has the promise of being the first, if not the only, revolving or rotating sushi joints in town. Feeling nostalgic and, like always, hungry, we saddled up on a warm weekday afternoon and decided to check it out. The first thing we were hit with once we entered, was the scale of the place. It was pretty big; slightly cavernous and very very clean. The stainless steel that snaked around the tables and booths were wiped to a military regime shine. On these polished metal counters slithered a conveyor belt train that moved seamless throughout the wide open space. Wait. I didn't see any mini trays of rolled fish skimming on water. In fact, I didn't see any water. Come to think of it...there wasn't even any sushi at all! That's right. Laminated cards with images and descriptions of the food, moving around the seats in a weird jangly motorized dance. Immediately we were a bit disappointed, unable to recreate the first time we had sushi together in a cramped sushi boat joint near Chinatown...because there were no boats. Then what's the point of having a "revolving" or "rotating" sushi restaurant where there isn't any sushi that's revolving or rotating around you? Laminated placards on stands? This is odd. I mean...what's the deal here? Okay...but where's the actual Tiger Roll? Looks good. Just no real Ninja Roll. Okay. Maybe we were getting ahead of ourselves a bit. Sure, this is Tucson, in the summer!, so maybe having lil tug boats of fresh fish and seaweed navigating on tepid water isn't the best idea. Especially in a room as big as this one. So, why the flowing belt design then? Is this like a "gimmick"? We were kind of confused but we took a seat regardless. Here's the thing: we were the only ones here at the time. Like I said, it was mid week, mid afternoon and mid summertime near the U of A. Not a lot of traffic on the streets this day. So maybe when its slow they convert to advertisements on stands rather than real fish. According to our very nice and very attentive server (which made us perk up a bit because getting great service on non peak hours is rare) this was not the case. Just rotating signs. Here's how it works: You find the food item you want to eat (which can be tricky because they move at a fairly rapid clip), place it on the end of the table, a server will grab it then bring you the dish. Right. Sounds easy enough. But why... Oh forget it. I still didn't really see the pint of it but, whatever...we were really hungry and started grabbing laminates that seemed reasonable to quell our rumbling tummies. Wait! Slow down! I'll have... C'mon! We needed apps and snacks stat. The edamame advert whizzed by and we grabbed it. Since we were the only ones here (well, one couple walked in a little later but, they don't count) our server grabbed the sign and within seconds, fresh, salty and steamy beans were on our table. The edamame came in a bowl that was topped with a plastic dome, sort of like a sushi grade Tupperware. The server popped it open and we were met with grassy vaporous beauty. It smelled really good. Digging in we were very pleased to find that they were lovely and fresh; soft and flavorful with a good crunch. So, do they have some kind of sushi sorcerer back there making this stuff hot n' ready in no time flat, or does this place know how to prep for efficiency and massive flavor? I voted for the latter, even though I always go for the wizard chef ideal. The edamame was really good and was in front of us in a few seconds. Amazing. Then it occurred to me: what if QQ is out to be a sort of Jimmy John's of the sushi circuit? I could see that. In fact, while I grabbed placards for some miso soup and gyoza, I suddenly had this image of the place jamming it out on a packed Friday night. I saw servers running and swirling around each other, picking up orders off of tables and then grabbing the pre-made food before dashing back to the table, opening up the top and watching the hungry patrons dive in. Sure. I could see that. But how does the hot food stay hot? Microwave? I guess. That doesn't seem very fair but...whatever. The miso soup was hot and full of rich flavor in a light broth and the gyoza was done to a piping crispiness and loaded with succulent vegetables and seasoned meat. Quite yummy. Suddenly, I began to really like QQ. But I was still scratching my head. Hot brothy miso soup was actually really tasty. Gyoza was flavorful and meaty. So far, we were really impressed. The appetizers had won us over so far. They arrived with lightning speed and precision and were really yummy. Not the best we'd ever had but definitely not the worst. Far from it. Hot, delicate and done to near perfection. 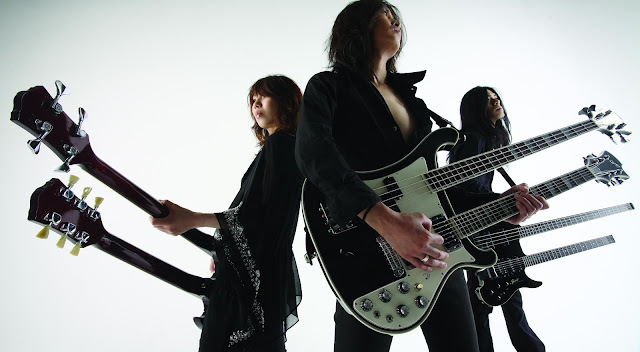 Now it was time for the real mama jammas. First up we ordered, well...'grabbed and put at on the edge of the table', a couple of nigiri. This is a true test for a landlocked sushi restaurant: can they deliver a fresh and delicious bite of raw fish with no ocean in sight for miles? So far here in Tucson we have been lucky to have had some incredible nigiri...and some not so much. But can a place such as QQ, with it's already prepared concept and near instantaneous dispatch of food, promise to have such tasty morsels? Tuna nigiri. So good, so fast...who knew? The fish was fresh and full of flavor with a smooth buttery texture. I personally thought the rice was a little tough, but She-Ra thought otherwise. Just a slight dip of the fish into the soy sauce brought me back to coastal days in California, except it was 100+ degrees out and I couldn't see an ocean. We've had better but for the price and the fact that I couldn't see a sushi chef anywhere impressed me that perhaps we are eating future food. Did they teleport the stuff from Sushi Island? Is that really a place? The fish was good, tasted like decent tuna and salmon and cut with precision. Great. How are they doing this with such a limited staff and in the middle of the Sonoran desert? We didn't care. It was time for some rolls. When we go to a new sushi restaurant we always order some standards. That way, if they screw up a California roll or the like, we know not to come back. Once a sushi joint has been established with us, then it is off to the neither races of oddities and house specialties when we come back to visit. So we kept it safe here with a spicy shrimp and crab rolls. Once again, with the efficiency of a ADD cheetah on meth, the rolls arrived within no time. The spicy shrimp was really good. Had a definitive tang from the chili oils and spices and was cooled off by fresh seaweed and little pops from the roe. A lovely roll indeed. The crab was offset by tempura vegetables and cream cheese and topped with an almost bar-be-que sauce and crunchy tobiko. Again, we were vastly impressed. All of these flavors came together in a very surprising and symbiotic way. The sushi rolls were quite good and we will most likely be back to try some, say, more "challenging" options. If they got the basics down on lock like this, I'm sure QQ can deliver other tasty items and, I'm sure, in the fastest way possible. Again, how do they do it? I didn't care. I was too busy eating and enjoying myself. Recently we got word that a QQ sister restaurant just opened on Swan and Grant, in an old Chinese buffet space next to Chipotle. Sure. I'm game! 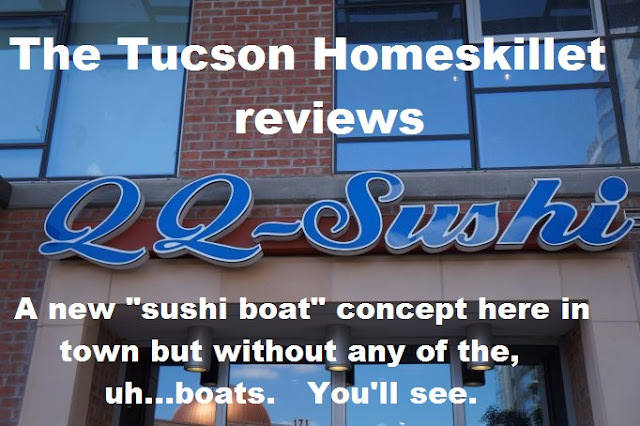 If it's anything like the original QQ Sushi here my bet is it will be a busy boon to that side of town. As far as this location is concerned, we liked it a lot. Good food, really attentive, friendly and efficient service and the quality of everything was quite surprisingly top notch. Plus after all the food we ate, we walked out of there with a bill that was less than $30, not including tip. Uh, yeah. We will most likely be back. But I'm still not sold on the 'signs on stands on a conveyor belt' concept rather than floaty boat trays carrying sushi bites. Maybe it's just the nostalgic nerd in me, but I really loved all of the sushi boat restaurants I visited in the past, especially that one in San Francisco where we talked all afternoon and knew we wanted to get married. Oh well. Maybe that concept is just not meant to be here in the desert. Sigh. In summation, QQ Sushi is a hit. Not a grand slam, but a good double or triple play and I can only see them getting better. If you are in the neighborhood please drop in and see for yourself. Maybe the laminates make more sense to you. Who cares though? The food was awesome. Although if there is anybody reading this that wants to open up a real sushi boat joint, let me know. I'll be the first to say "Yes!" and be the first in line opening night. Wait. They have a full bar? Why didn't you tell me? Jeeze! You can find QQ Sushi at 1011 N. Tyndall between Speedway and 1st Ave. When a neighborhood comes together.